Club Carlson has launched a targeted app booking bonus of 5,000 points for one stay that is consumed between March 30 and April 30, 2015, and booked March 30 – April 5. The offer is valid only for targeted Club Carlson members that received the offer and the booking must be made using the app. You can access Radisson’s website here. There is no landing page on Club Carlson website for this offer. The terms and conditions indicate that this bonus would be only applicable on prepaid rates, but the actual email sent doesn’t. Not sure if this is just an oversight or whether it will be enforced too. This offer was probably sent to those Club Carlson members that have not logged into their accounts using one of the mobile apps. 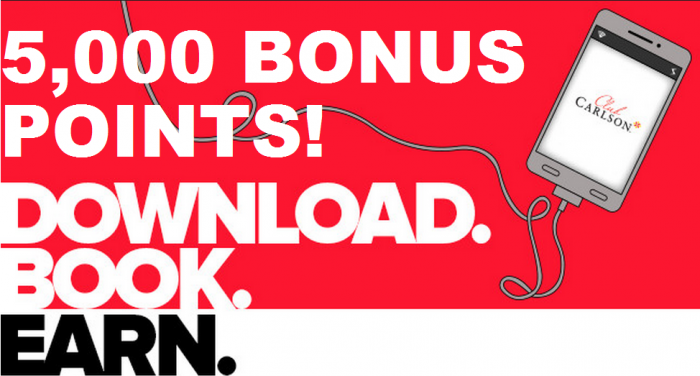 You must be an existing Club CarlsonSM Elite member to participate in the 5K Bonus Mobile App Promotion (“Promotion”). Promotion is available exclusively for the Club Carlson member number associated with the email address to which the Promotion invitation email was sent, is non-transferable and may not be resold, auctioned or bartered. To be eligible to earn 5,000 bonus Gold Points® (“Bonus Points”) you must make a reservation using the Club Carlson mobile application between March 30, 2015 and April 5, 2015 (“Promotional Period”) and pay in full, in advance for a Gold Points-eligible stay at Quorvus CollectionSM, Radisson Blu®, Radisson®, Park Plaza®, Park Inn®by Radisson and Country Inns & Suites By CarlsonSM hotels worldwide beginning on or after March 30, 2015 and completed by April 30, 2015 (“Eligible Stays”). Members can earn only one bonus during the Promotional Period. Stays paid for using Points + Cash are not eligible for this Promotion.